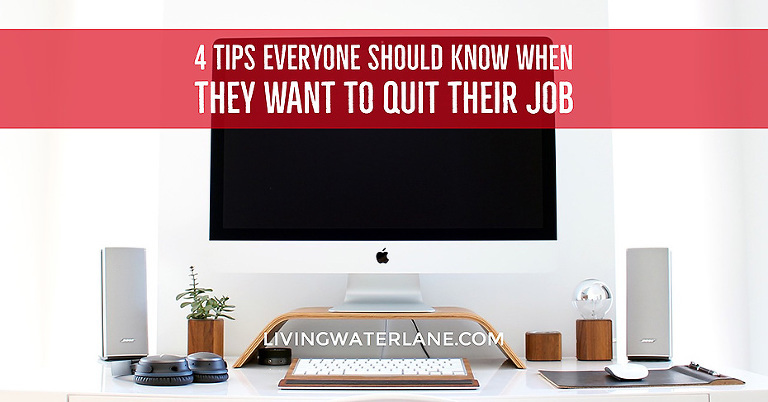 I recently talked with a friend who really wants to quit her job. Her children are growing up quickly and her husband is doing well in his career and they believe his income can support them. She really feels like if she doesn’t step away from “work” at this time, her chances to enjoy her children while they are still young will be gone in a flash. Yes, she is nervous…can they really make it? What will she do without her “own” money? As I mentioned in this post, quitting my day job was not something that I did hastily or took lightly. I prayed about my decision, talked with people I trusted and made a plan while giving myself time to really make a good sound decision for my family. 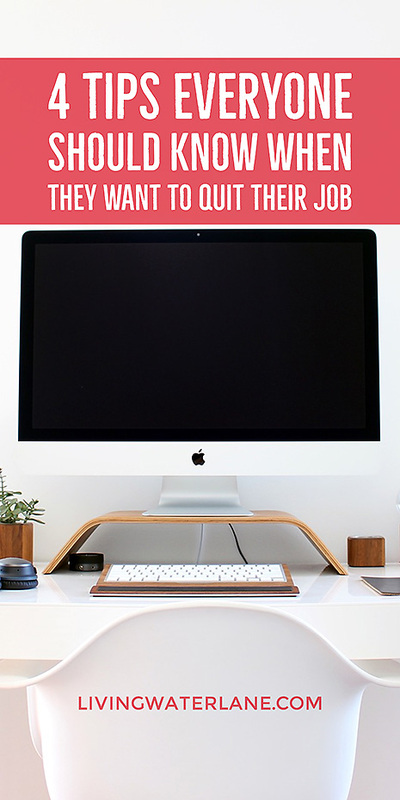 If you have ever felt the tug to leave your job to either stay home with your children or possibly even pursue a new passion, then here are a few tips that may help you as you work toward your goal. First, do not get in a hurry. You need to make sure you have a good foundation laid first so that your transition will be a success. I would say a minimum of 3 months to 6 months would be a fair estimate on the time it will take to get prepared. Knowing this, you can keep the feelings of instant gratification at bay of wanting to just quit…and make sure that you are making this decision because it is best for yourself and your family. Sometimes unresolved conflict in our workplace can lead us to want to leave…make sure nothing like that is driving you. Second, stop using your income. Yep, not one penny! You can not accurately judge whether you are able to make it without your job if you still use money that you are making at your job. Every dime from your paycheck should go into an envelope system and put into a place where you can not touch it. Why? Now is the time to make sure you truly can survive on one income and also to be sure that you have your backup funds ready for emergencies down the road. Your particular envelopes may look different…but, for me, these were the important things: Emergency Fund ($1000), Car Insurance (whatever your yearly amount is), Tires ($1000), Christmas ($200 per child…unless you are used to spending less), Home Insurance (if not in escrow with your mortgage), and any other large bills that come due once a year. The reason that I would budget for these items out of your income that you are no longer using is that they could possibly stretch your budget when they come due. With 2 incomes, these would not be a problem, but during your first year with only 1 income, they could cause you to struggle. Make sure that you keep growing your savings envelope once the others are full…depending on your personal income and current expenses, you may need much larger or smaller amounts in your envelopes. Just be sure to spend the months you are planning saving back EVERY.SINGLE.PAYCHECK. Third, get real with your spending. If you are like most people, most of your spending is done through a bank account (if you are a cash spender, you will have to work a little harder to track yours!). First, download a program like Mint. This program has revolutionized our budgeting and tracking of our finances. It also has made tax prep much easier at the end of the year as a small business owner. Mint is so awesome because it will take all of your bank accounts and credit accounts and bring them into one place…then, you categorize your spending and track your budgets all within the app. For me, I have accounts in more than one bank, plus a credit card and it incorporates all of those items into one place so that I can quickly and easily verify transactions that have cleared and categorize them appropriately. Once you have everything set up, Mint can remember how you categorized a purchase and it will do the same each time you purchase from that store again! Spend the time getting this set-up…it will be worth it in the end! Not only will it help you in the future once you stay at home, but it will help you now as you get real about your spending. You can see how much your family is spending on groceries, fast food, restaurants, coffee shops, clothes, gas, utilities, etc. Why is this important you may ask? Well, I am going to tell you! Most likely you will need to change some, if not all of your spending habits. Yes, I totally just went there. Sometimes to make the transition that we want to make to a better life with our family, we have to sacrifice a latte or two. Finally, make a plan. Once you know how much you are spending and realistically how much you need each month to live (taking into account areas you are willing to cut back). Then its time to make a plan. First, make a budget. Use the information you have gathered to plan how much is needed for the essentials and extras each month. There are many great budgeting tools available online…If you started using Mint, you will be able to create your budgets and set alerts right inside of it! The main thing during this time is to be honest and communicate well with your spouse (if you have one). Talk openly about the goals you each have for your family and finances. Many women feel like they need to keep working so that they have their own money to spend. Often, their spouse is not as picky as they think they are. Good communication will be key during this time! Hopefully, these tips will help you as you navigate an exciting and scary time in your life! Making a big decision like this can seem overwhelming, but taking it step by step will help you determine if it’s right for you! 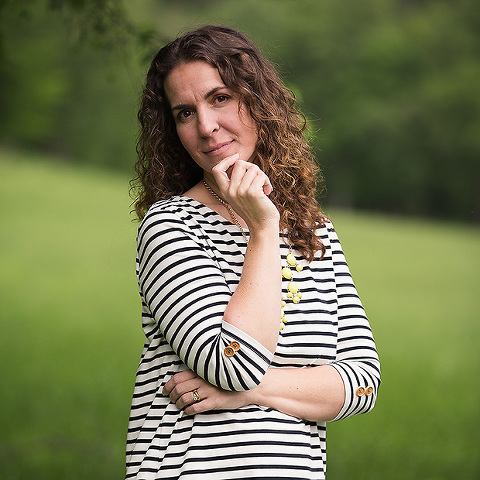 I would love to share successes and tips that you have as well! Feel free to comment or message me to talk more! DISCLAIMER: I am not a professional anything…I just like to share tips and successes that I have had in the past…please note that my results may not be the same as yours and that you should consult a financial professional about your personal situation! View Full Policy Here.